Can't say that I do. But August 18th I'm taking off from Charlevoix and headed to Beaver Island. You should join us. I make it to Northern Lake Michigan as often as I am available to do so. I try to sail out and camp on North Manitou Island at least once a year on my G-Cat 5.7 (in Avatar) . That is Grand Island in my Avatar photo (not much of a sail but a fun trip none-the-less). I have yet to sail the bays, however that is where my boat spent most of its life. I actually came on here today to post in order to see if there is any interest in circumnavigating the lower peninsula(yes, I know you cant actually circumnavigate a peninsula but you know what I mean). I have been wanting to do it for a while now. Maybe start at Warren Dunes S.P. and end at Sterling S.P.? Lewiston MI, East Twin Lakes most weekends. Walloon for a week mid July. Mgriff the last two years we took a trip in August around Beaver Island. This year we plan to depart from my house in Ogden Dunes, IN and head up as far north into Michigan as time allows. We should plan on sailing together. In '75 got a call from friend Don Sapikowsky. "let's sail home" from our CRAM regatta in St Joseph, Mi to my house in St Clair Shores (near Detroit). "It'll take too long Don, find someone to bring a trailer to Machinaw". Second phone call. "Donahue will bring a trailer up". Took us 4 days on our Prindle 16, slept on tramp every night. Awesome going under the bridge ! My neighbor here in Big Bear has a N-6.0 in northern Indiana and there's talk about sailing Lake Muskegon, then up the shore a ways. Pete, Big Bear Lake, Ca. Pete I remember you telling me about that trip. Now it just so happens I too have a Nacra 6.0 in Northern Indiana... Why don't you two join us in August for a trip up the coast. Ogden Dunes to Mackinac. Disclaimer I don't know why my pictures become inverted. I even tried rotating them upside down before uploading. When I try to rotate them on this site they become corrupt. Give a link to the page of your album and I'll see if I can fix the orientation. Edited by Kevin219 on Dec 19, 2018 - 03:05 PM. Just moved up to the Petoskey area and regularly join in on the weekend CRAM events but was interested in sailing out to Beaver island this summer. I'm hoping to partake in a couple CRAM events this summer. I'm in the market for a h16 for just that. As for Beaver Island I'll definitely be headed there this August. You should trailer down to Indiana and take the long way home. It looks like I've successfully recruited mgriff for the journey as well. 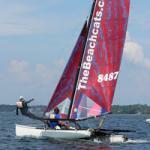 One of the regattas will be in your back yard this year :) Jun 21-23 in Michigan City. I've got a yellow P-16 with orange sail on Bowers Harbor--maybe I'll see you out there sometime this summer. I have a blue Hobie 16 to get you into CRAM! I believe she is a 1980. She would love a new home to be sailed more. Hard to give equal love to 3 Hobies during a short summer. CRAM's H16 fleet is growing to about 14 boats this year, and maybe even more. When I find them I will post the pictures of the boat.